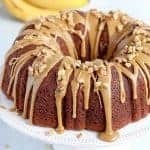 Banana Bundt Cake with Brown Sugar Glaze – Thick and soft banana cake with a tender buttery crumb, topped with a decadent Brown Sugar Glaze. 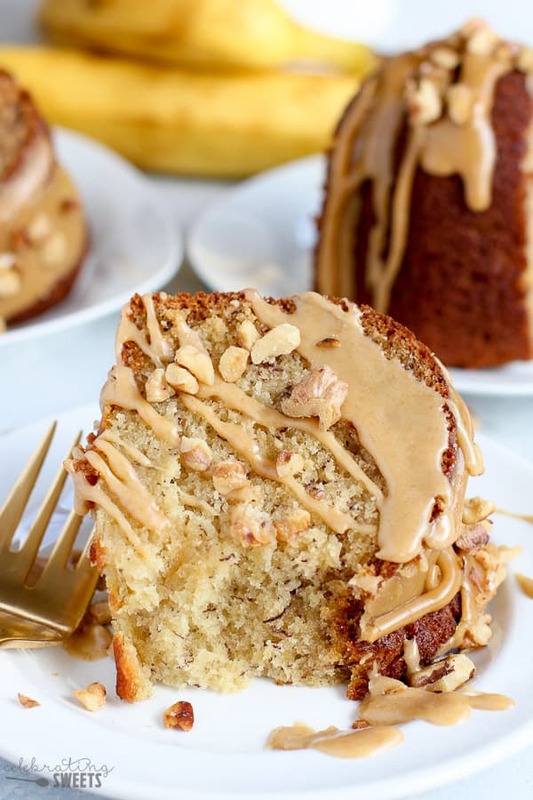 The BEST Banana Cake EVER! This here is the only banana cake recipe you will need from now until the end of time. This is the BEST banana cake I have ever (I mean, ever!) sunk my teeth into. 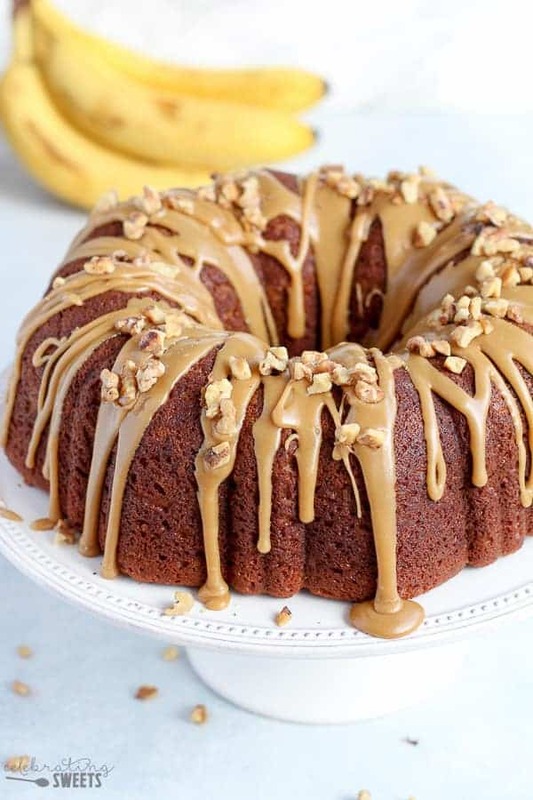 Note: I now buy bananas, ban my family from consuming them, then wait for them to ripen so I can immediately bake this cake. Also to be noted, I might need to move up one pants size if this banana cake habit doesn’t quit. Wah. I have been on a search for the perfect banana cake for months. I went back and forth about whether it should be a sheet cake or a bundt cake. What should I top it with? Cream cheese frosting? Brown sugar glaze? Chocolate? Decisions, decisions. All my testing landed me on this recipe, which comes from the brilliant Dorie Greenspan. I made very few changes to the cake recipe itself, and I would call it perfect. 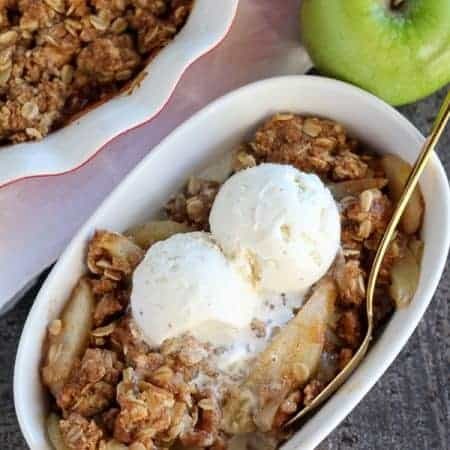 Nearly two cups of mashed bananas add the banana flavor, sour cream adds moisture and balances out the sweetness, vanilla extract compliments the bananas, and the right amount of butter creates a tender crumb. See what I said about perfect? 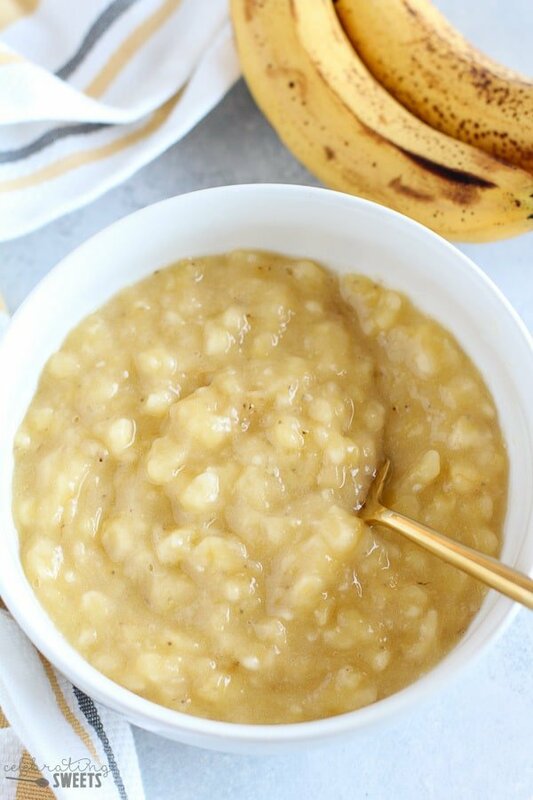 I resisted the urge to add cinnamon or chocolate chips in order to really allow the bananas to shine. I am so, so, happy with how this cake turned out. Its flavor and consistency are spot on. This cake can absolutely hold its own as-is, without the brown sugar glaze. You can serve it plain, dusted with powdered sugar, or with a smear of salted butter. 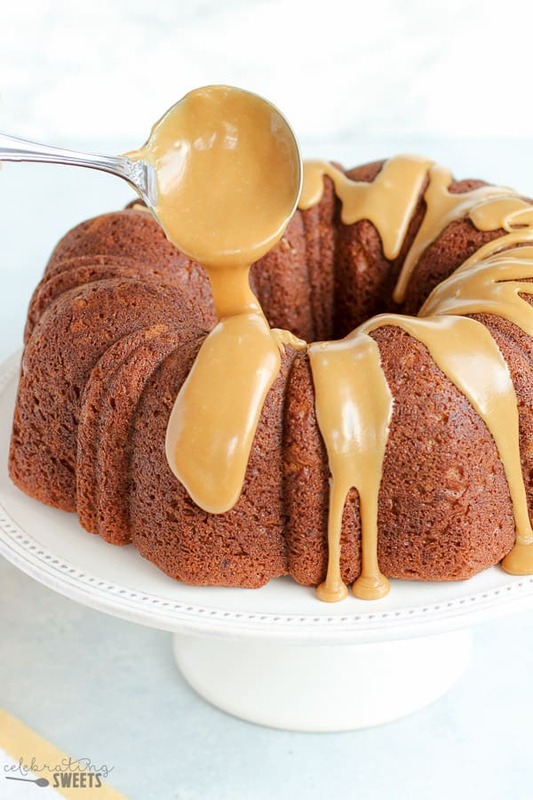 But, because I am a “more is more” type of girl, I went ahead and whipped up a brown sugar glaze to pour over this beautiful Banana Bundt Cake. This quick and easy glaze is made with butter, brown sugar and vanilla. It tastes like carmel-praline-brown sugar heaven. 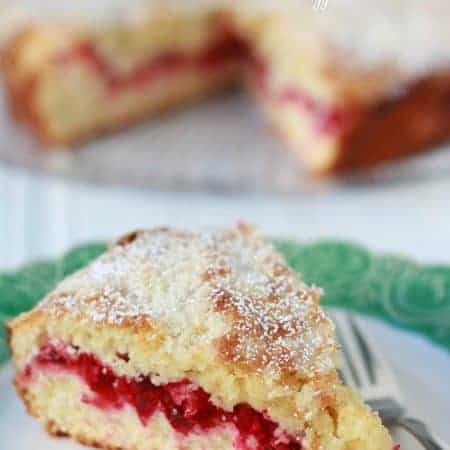 It slowly drips down the sides of the cake, coating each bite with sweet and buttery deliciousness. The glaze firms up quickly, which means you don’t have to wait too long before diving in. Bonus: the glaze also acts like glue if you choose to garnish your cake with chopped walnuts or pecans. Now, what are you waiting for? You know you want a slice of this cake. Bake, eat, share and enjoy. P.S. There’s bananas in it, so it can totally be eaten for breakfast, right? Morning, noon, or night – I will never, ever turn down a slice of this beauty. 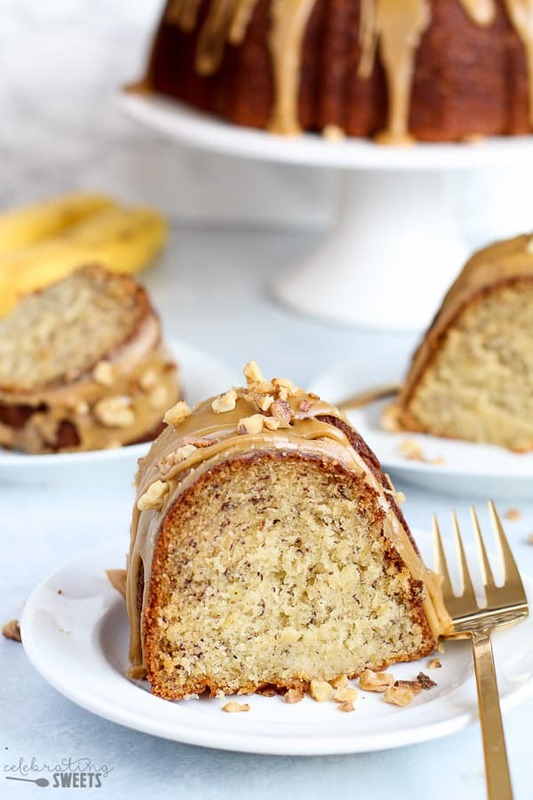 The absolute BEST Banana Bundt Cake- Thick and soft banana cake with a tender buttery crumb, topped with a decadent Brown Sugar Glaze. Preheat oven to 350°F. In a large bowl, combine flour, baking soda and salt. Set aside. With a hand mixer or stand mixer fitted with a paddle attachment, beat butter until smooth and creamy. Add sugar and beat for another minute, at medium speed, scraping down the bowl as necessary. Add vanilla, then beat in 1 egg at a time. Mix in bananas (the mixture might curdle, that's ok). Add half of the dry ingredients, sour cream, and then the remaining dry ingredients, mixing between each addition. Thoroughly grease a 12-cup bundt pan and add the batter to the pan. Rap the pan on the counter a couple times (to remove air bubbles), then smooth if the top. Bake for 55-65 minutes, until a toothpick inserted into the center comes out clean. Loosely cover the cake with foil if it starts to get dark (this was around 30 minutes for me). Place the pan on a wire rack until it is cool enough to handle, then carefully unmold the cake and place it back on the rack to cool completely. In a small saucepan combine butter, brown sugar and milk. Bring to a simmer, whisking frequently and cook until the sugar is dissolved, a minute or two. Remove from the heat and cool for 5 minutes. Add vanilla, whisking to combine. Add powdered sugar 1/4 cup at a time, whisking vigorously, until you reach your desired consistency. The icing will start to firm up quickly so have the cake cooled and ready. 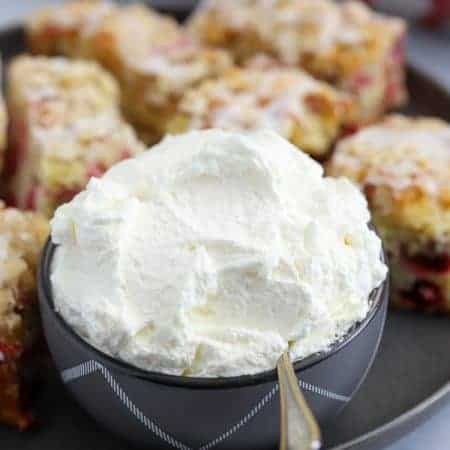 Drizzle the icing over the cake and immediately sprinkle with nuts. The icing will set in a matter of minutes. I made this cake and it was a HUGE hit. It’s a keeper! Fantastic! Thanks for the comment and rating. Enjoy! This looks delicious. Would you happen to know how long I’d have to bake them if I use a mini bundt cake pan? This is my favorite bunds cake! It is so simple to make and such a crowd pleaser. My VERY picky husband even loves this cake. 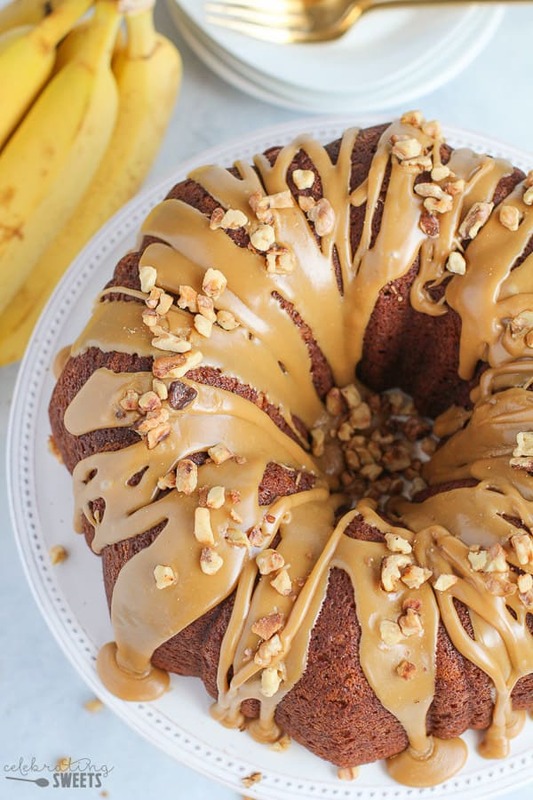 I look forward to my bananas getting too ripe so I can make this cake.